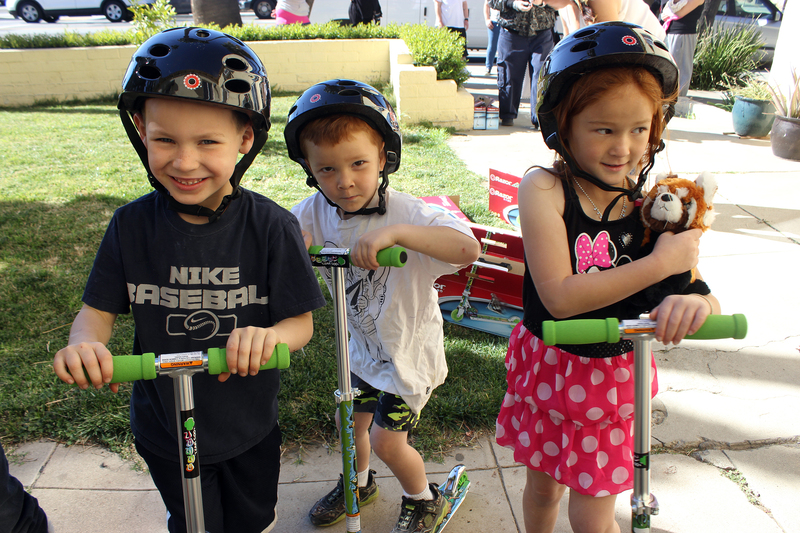 A new razor and helmet was gifted to each kid at New Hope this month by the Girl Scouts of San Gorgonio Council. 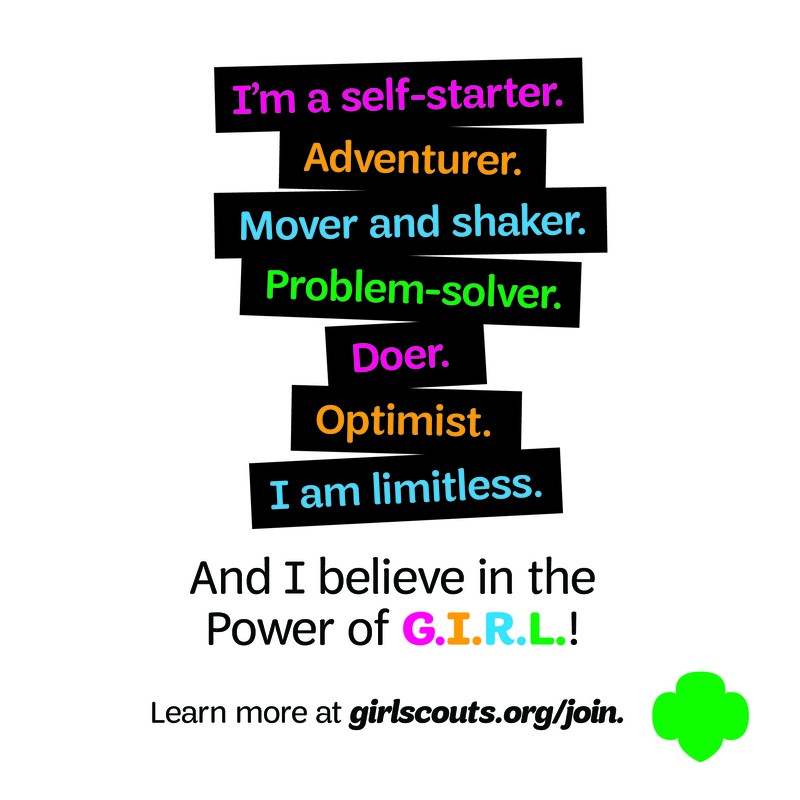 The Girl Scouts of San Gorgonio Council delivered a van full of Girl Scout Cookies, plush toys and twelve new scooters to New Hope on February 17, 2015. It was a perfect match: twelve was the exact number of kids currently occupying or visiting their mother at the shelter this month. A New Hope resident with the single, broken down scooter shared by 12 kids. “They have one scooter back there for twelve kids and they all fight over it,” said Linda Lambert, the mother of two perky girls, Isabel and Elizabeth, and their little brother Junior. However, Linda isn’t your typical mom and New Hope isn’t an ordinary women’s shelter. Her brown hair is pulled into a no-nonsense ponytail and the large tattoo adorning her right arm is clearly visible with the white tank top she wears. No makeup. Linda has the air of someone who’s seen it all – someone who’s cycled through the criminal justice system. As for New Hope, the 36-bed facility in Beaumont, CA is run by Mental Health Systems (MHS), a non-profit organization that delivers drug and alcohol and mental health recovery services to adult female offenders exiting the California state or county criminal justice system. The families at New Hope vary: some are on ACP (Alternative Custody Program) meaning they must wear a GPS bracelet or are parolees from prison that either choose to be at New Hope or must attend as part of their parole conditions. “The best experience that you have here [at New Hope] is the reunification of moms with their children,” said Patti Haire, New Hope’s Program Manager. In order for children to stay overnight or live at the facility, like the Lambert does, a child must be 12 years old or younger. 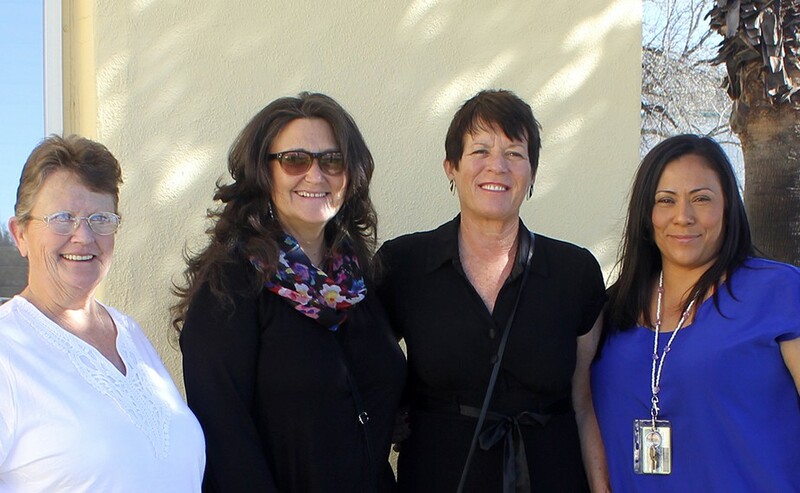 The New Hope team, including Ms. Patti Haire (third from left). New Hope’s main objective is for women to become fully employed and independent during their stay, which can typically be around 18 months. Some of the women exiting New Hope within the next month will be leaving the program with $6,000-$7,000 saved so that they can start anew. Working and saving money is a necessary step for these women to make the transition from a criminal life into a crime-free life. This amount saved is especially impressive when you take into account that more than a quarter of American’s have no emergency savings whatsoever. “Our women become empowered to live free of drugs and crime, and most importantly, to not be so dependent on everybody else to take care of them,” said Patti. 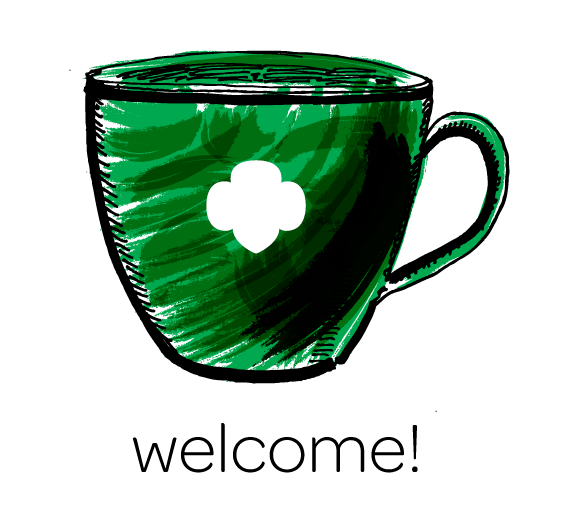 While the moms of New Hope establish their independence and chart new lives for their families, individuals and organizations like Girl Scouts of San Gorgonio Council continue to bring small vignettes of happiness to the every day routine of living at New Hope. 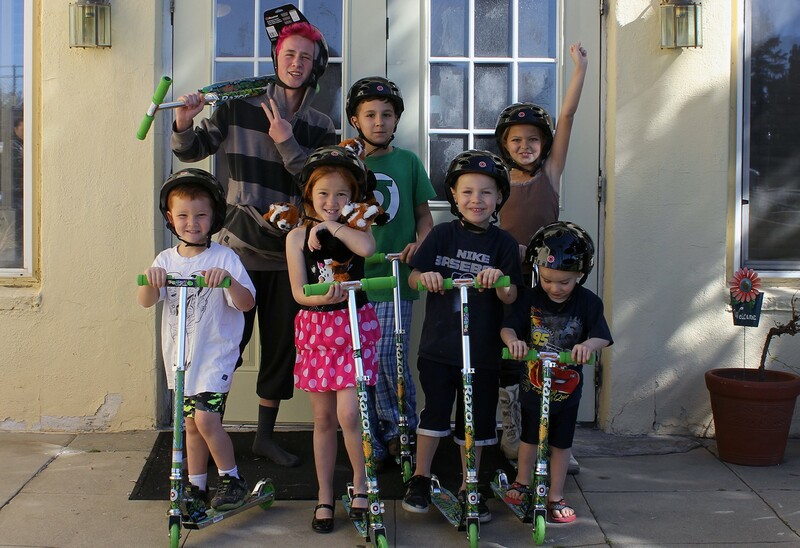 Linda’s children will no longer have to share a single scooter with nine other kids, as they are each the proud new owner of their very own. “This is so awesome, so crazy, I can’t thank you enough,” said Linda. Her daughter Elizabeth, 6, is a face full of smiles topped with bright, red hair. “I love my fox!” Elizabeth grinned. Whatever decisions, or indecisions, led each of these mothers to New Hope, there is clearly a lot of love and eagerness for a better, more hopeful future this day. 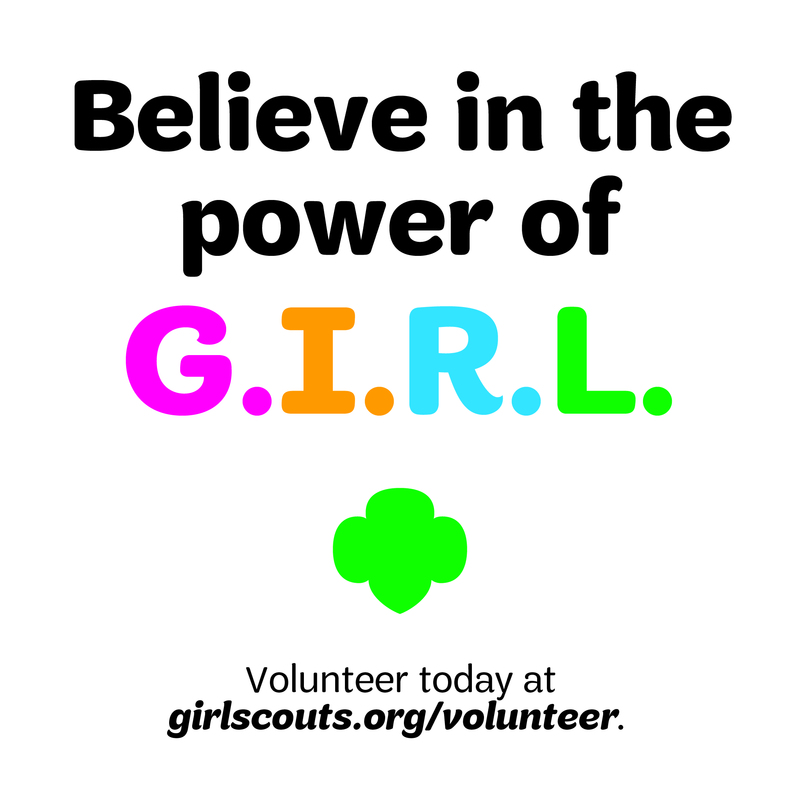 Girl Scouts of San Gorgonio Council expressed interest in hosting activities for the children. While New Hope provides many services to the adult residents, including parenting classes, there is currently no programming for the kids. Previous Previous post: How many girls can say they learned about 3D printing, laser cutting and composites in a single day? Next Next post: The biggest news since…ever! Golden Tickets + cookie customers = big wins!